The benefit to you is 40 years experience in the business. We know the coffee market inside out, back to front because we’ve been sourcing coffee from around the globe for years. We understand our consumers and how they’re forever changing, so can share with you our insights, allowing you to create the perfect coffee house experience for everyone. Expect more than just coffee…. 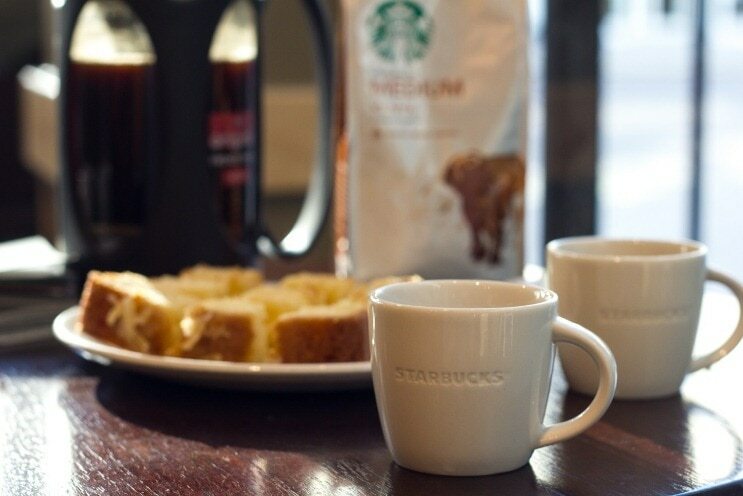 To say we are experts in coffee is true, but Starbucks is not just about coffee. We believe in the whole experience and everything that makes that experience unique, from the moment you walk in the door to when you leave. We’re continually striving to improve our coffee house experience ensuring our customers enjoy the moment and have something they always like. That’s why we offer a wide range of Tazo teas, a brand new breakfast range, exclusive bistro boxes, sandwiches and wraps, cakes, pastries and petites to suit anyone’s tastes. Starbucks is about creating the perfect moment for everyone, just the way they like it. Our community is core to the Starbucks brand and who we are. We believe in helping not only the communities that our stores are in but also the communities from where we buy our coffee from. This is built upon the truth that we can use our size and name to really help make a difference. This is not so we can shout about it either, but simply to help other people in our local community make a difference. We encourage all franchisees to do the same and be active within their own community. Usually, they support community programmes like local junior football teams or issues relating to the environment. So it’s these types of things that help us earn respect within and outside of store, as respect from your local community goes a long way. Delivering the undeniable impact of our globally successful retail network. Creating a loyal following and helping drive increased footfall. Utilising proven operations systems and comprehensive support tailored for your specific needs. The franchise store program is available in all locations and site types.